Last night, my husband went to put the boys to bed. Three hours later, my son came downstairs. He talked his dad to sleep. They talked about video games and how my son would design one, and the economy. I’ll need to take economics at some point, in school. I’ll have him do my homework. This is the only photo I got with both boys in the same shot. 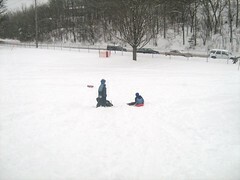 Click on it and I have a bunch of photos from when I took the boys sledding at the Bunker Hill Golf Course in Dubuque (which allows sledding with 3+ inches of snow), and some photos from the St. Paul’s Lutheran Christmas Pageant where Kayleigh narrated with other kids in the Sunday School class.